**Second Chance on this wonderful home!! Showings begin Monday after Easter! 4 bedroooms, 2 baths; 1948 sq feet finished on a cul-de-sac road; close to the boundary of Northiew School District – owners do school of choice for Northview. Two expansive living areas! Dining area with sliding doors to deck which spans the side of home, with great views. All new Anderson windows on main level. Lower level finished with large family room; sliders to a patio; 2 bedrooms, a full bath, laundry, and storage. Outside you’ll love the large fenced in yard with plenty of room to play and mature trees. 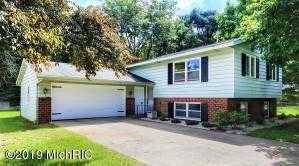 Large 2+ stall attached garage. Convenient location near Knapp’s Corner and Plainfield Ave. Please see attached aerial view.